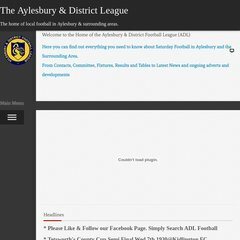 Topics: Club Contacts, Referees, Adl Minutes, Fixtures & Tables, and Cup Draws. ns2.5yearhost.co.uk, and ns1.5yearhost.co.uk are its DNS Nameservers. It is hosted by Canonical Range For Hp6-right (England, Berkshire,) using Apache web server. The programming language environment is PHP/5.3.21. PING (94.76.229.197) 56(84) bytes of data.